Diving on a full moon can be looked at in a couple of different ways. Some will say it’s better and some will say its off. From my observations I can tell you this. The full moon brings Plus tide's or an extra high tidal swing, stronger current’s and can also bring out the egg bearing critters. The Mantis shrimp gets its name from two animals it resembles without relation. Mantis shrimp are crustaceans for sure but they are neither shrimp nor mantids and in this case a peacock. So what are they? Well, glad you asked. 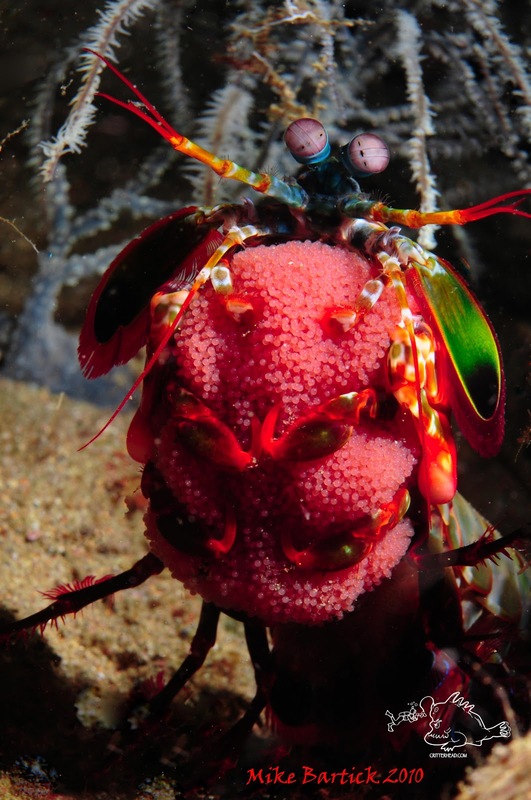 Mantis shrimp are in the order of Stomatopoda dating back 400 million years, WOW and with over 400 different varieties. Stomatopods are raptorial predators distantly related to crabs, shrimp and lobster.They feed on moluscs, cnidarians and other crustaceans and are one of the few animals that prey on the deadly blue ringed octopus. This by the way, also feeds on Stomatopods. The Shrimp(easier to say) is well equipped with either a spear like appendage used for slashing and killing its prey, or a duller more club like appendage used to smash its victim or bludgeon to death. Either way it is done with such intensity that the strike is likened to a .22 caliber bullet. Found on sandy or rocky bottoms they spend most of they’re lives in burrows only coming out to feed. This shot was done at night on a full moon and was a chance encounter. Spotted scurrying about and stopping I stalked him for several minutes before it finally turned around and stood up on its back legs. When It did I saw the eggs and managed to fire a couple of quick shots. These shrimp are thought to be monogamous through the parenting stage sharing the responsibility of caring for the eggs. Okay I know this is a blog, not a research paper, so grab a book and read up on these guys…too cool!! 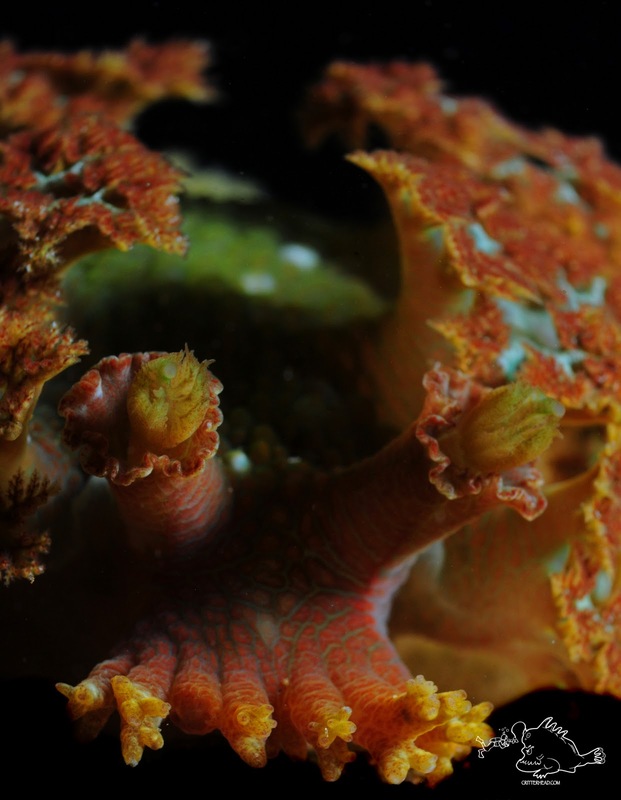 Animal mimicry in the marine world is truly amazing and none more amazing then when it comes to Nudibranchs. The Marionia nudibranch’s are predominantly nocturnal and selective feeders that prefer soft coral .The (Cespitularia ID.?) 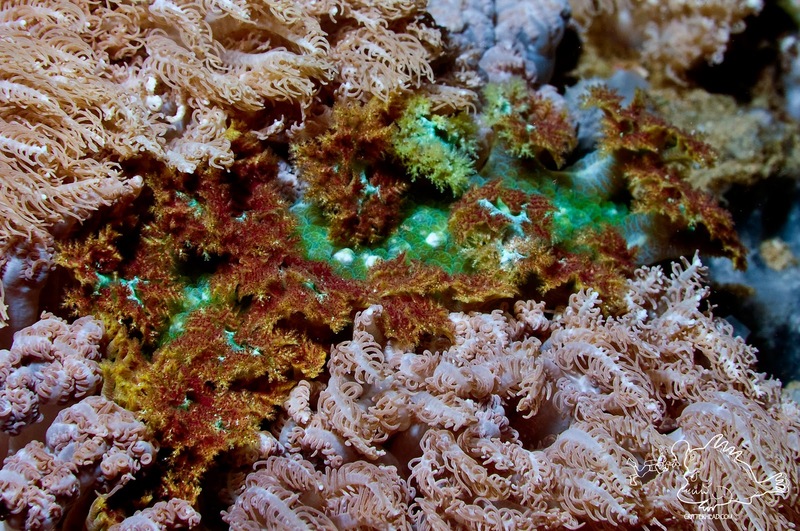 coral seems to be its favorite food source and model for mimicry. Often found tucked under the soft coral rasping away, this one was discovered right up top. When trying to find a Marionia look for the tell-tale signs of its presence by examining the stalks of the soft coral. Once you spot where the nudi has been feeding continue to search the area.